At Berkeley Bowl West a butcher by the wonderful name of Kevin introduced me to one of the new distributors whose meat they're now selling - Anderson Ranches from the Willamette Valley in Oregon. I picked up a few of their lamb loin chops and came up with the following recipe. Note that this requires an overnight marinade. In a mortar, add a pinch of salt then the garlic. Pound until a paste. Strip the leaves off of the oregano and rosemary and add to the mortar. Pound until the herbs are completely combined into the paste. Add the olive oil and pound again until everything is combined. Add some fresh cracked black pepper. (Alternately this could easily be done in a food processor but I'm quite partial to using a mortar for marinade pastes - makes for a different consistency and better flavor overall). Place the lamb chops in a large ziplock bag, then pour the marinade into the bag thoroughly rubbing it into the lamb. Close the bag tight then set in the frig over night. The next day when ready to grill, remove the marinade from the frig. Heat a grill on high until very hot. 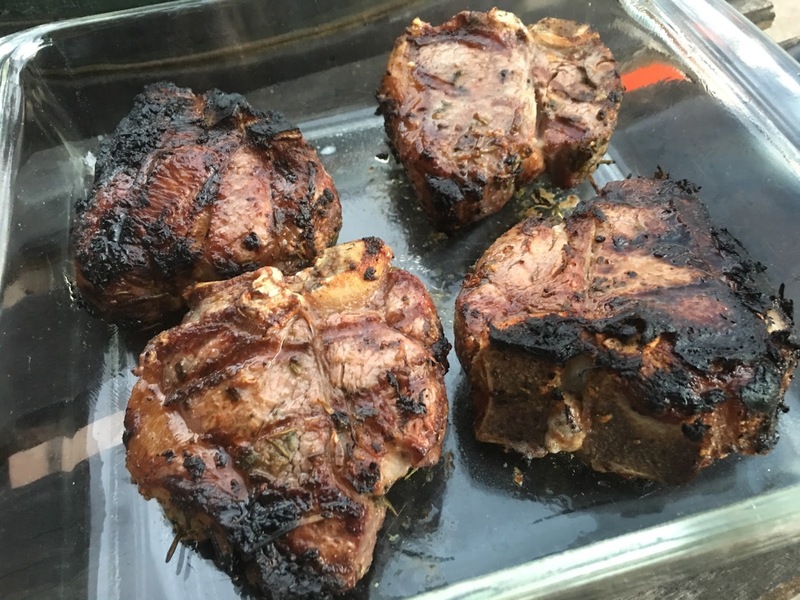 Remove the chops from the bag and place them evenly spaced on the grill being careful as this will most likely cause a flareup. Cover the grill and cook about 5 minutes. Open the grill and turn over for about 4 more minutes or until the chops are about medium rare to the touch. Remove the lambs, sprinkle sea salt along with the chopped mint and a light squeeze of lemon juice over them then cover loosely with foil and allow to sit for at least 10 minutes. When rested, serve immediately.